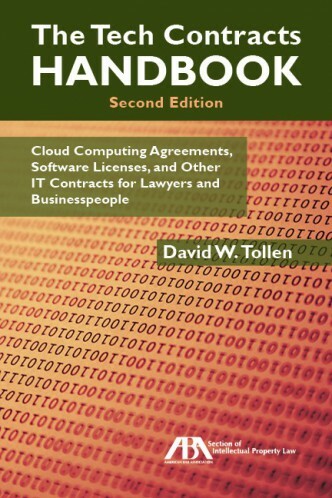 I’m very pleased to announce that the American Bar Association has published the second edition of my book: The Tech Contracts Handbook — Cloud Computing Agreements, Software Licenses, and Other IT Contracts for Lawyers and Businesspeople. The book is available directly from the ABA’s online bookstore. (You don’t need ABA membership to buy.) Amazon and other retailers will have it in a few months. The first edition was regularly the #1-bestseller from the IP Section of the ABA. The second edition is updated and expanded but still unusually user-friendly. 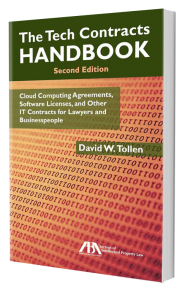 It’s a plain-English how-to guide on IT contracts for contract managers, salespeople, IT staffers, executives, and lawyers. It’s been endorsed by a long list of academics and lawyers, including, Ian Ballon, Executive Director of Stanford Law School’s Center for E-Commerce. This website serves the book’s readers, including by providing free tech contracts forms — as well as information about in-house and public training on IT contracts, which I provide through Sycamore Legal.